How Do Surgeons Learn to Operate? 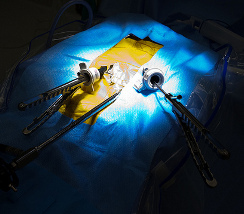 How do surgeons learn to operate – should it be on real patients? Join us on Wedsnesday 20th February to watch surgeons in action, discuss learning and patient safety, and practise your own surgical skills. The event provides a realistic insight into surgical education. Surgeons will re-enact an operation on the colon that was actually performed by a surgical trainee under the supervision of a consultant. The re-enactment will use some of the original video footage of what happened inside the patient’s abdomen. With social scientists who filmed and analysed this operation, we will explore the strategies that the trainee and the supervisor employ to ensure that the patient receives optimal care. You will also have a chance to experience what it’s like to learn to operate using simulation models.